I spent some time in the shop this weekend, but I have to say I’m really frustrated with my pace on this coffee cup cabinet. It should be a relatively simple project, but I’m moving in slow motion for some reason. I made the parts for the back of the cabinet out of Maple, I had just enough scrap to get this done. 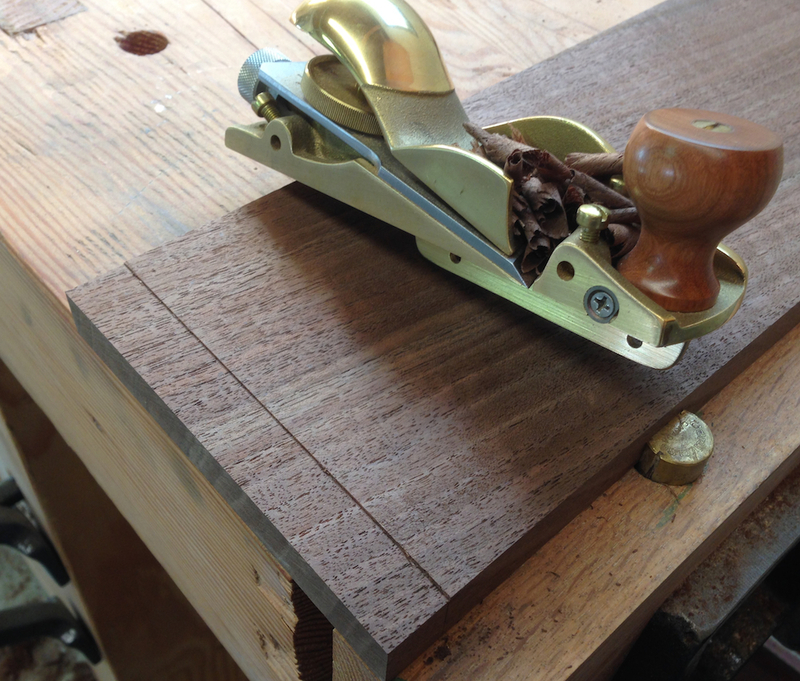 It was a lot harder to cut the rabbets for the ship-laped back with my Stanley #78 in Maple than in Pine. I spent some time flattening the back of the blade and sharpened it to the best possible edge I could and that helped. In fact, I ended up tuning up and sharpening several of my planes which felt good. One of these days I’m going to upgrade this to a #278 or the Veritas equivalent with the skewed blade, I know that would do a nicer job. I’ve been thinking about why this project is taking me so long. 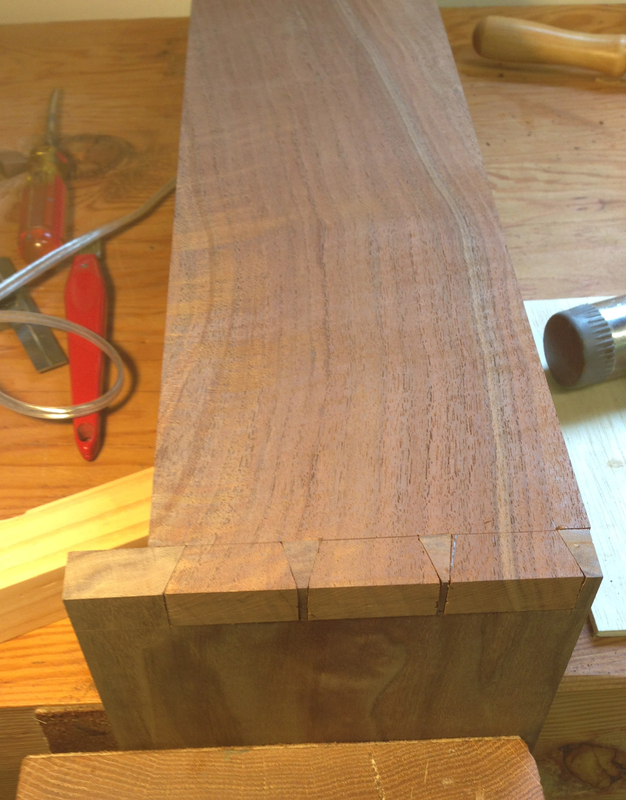 I’d imagined getting the carcase glued up this weekend, but ran out of steam. The problem is the details, and right now the main detail that has be stalled is installing the knife hinges. 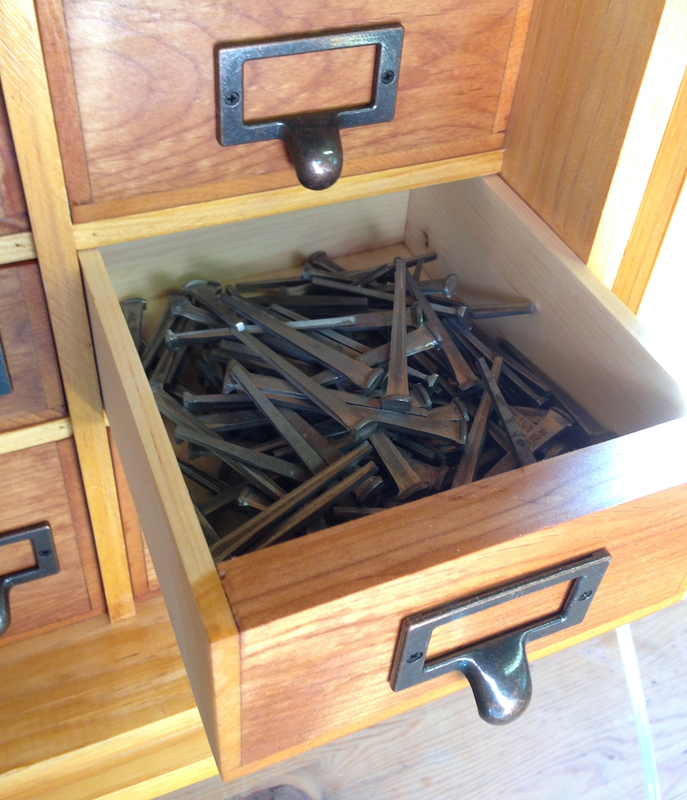 So far, everything on the project has gone reasonably well – but I’m afraid of screwing up installing the knife hinges. I’ve looked at several articles that describe different approaches to installing knife hinges, but I’m stuck. I think I need to do a couple of practice pieces to get past this block. Most of the articles I’ve seen involve using a router to clear out the waste, although I’d rather not use that approach. I’ll have to do some experiments and see what works for me. I made a door for my little Krenov-inspired coffee cup cabinet. 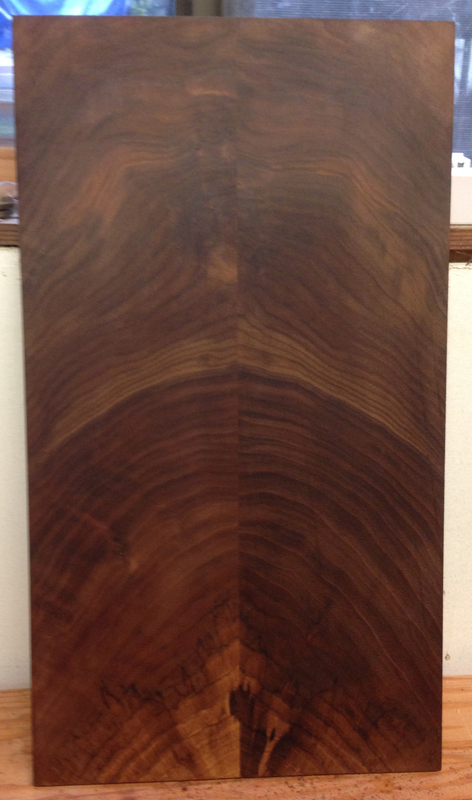 The scale and inspiration for this cabinet was a book matched walnut panel I glued up from some scraps on a whim. 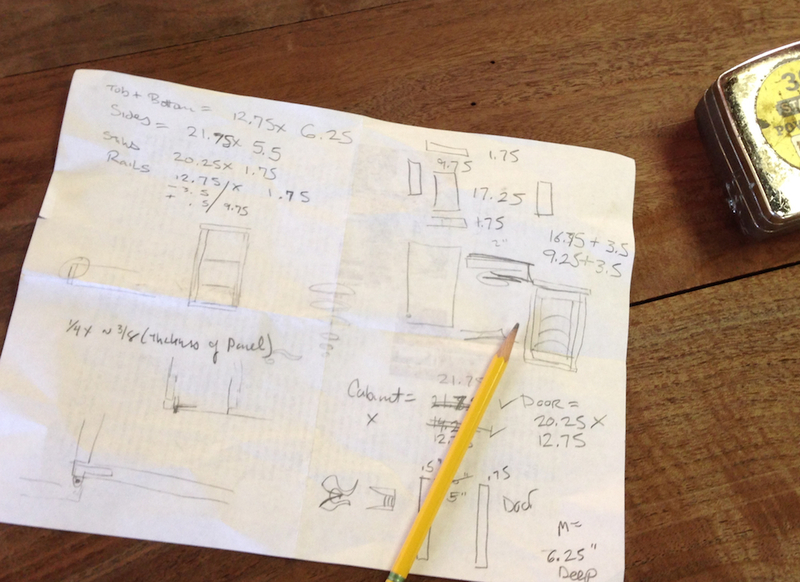 From there I determined the size of the cabinet and the door frame. 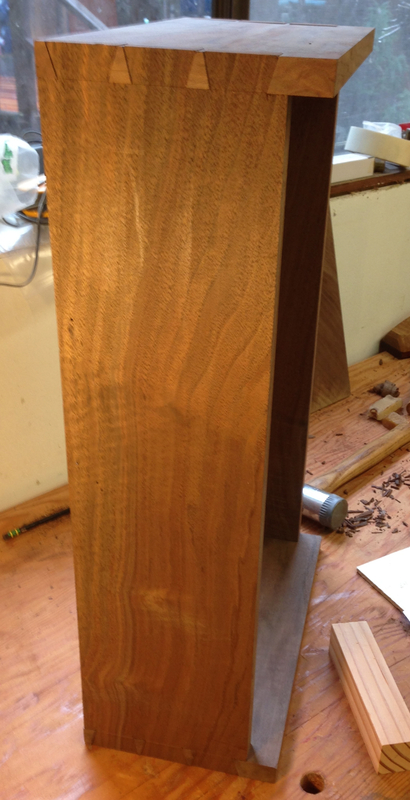 As I’d mentioned in the two previous posts on this project, the Claro walnut I had wasn’t as nice as I’d hoped. I used the best pieces on the cabinet sides. Getting the pieces for the door frame was a little bit of a struggle. I looked at the boards I had left and picked out the areas I thought might work. 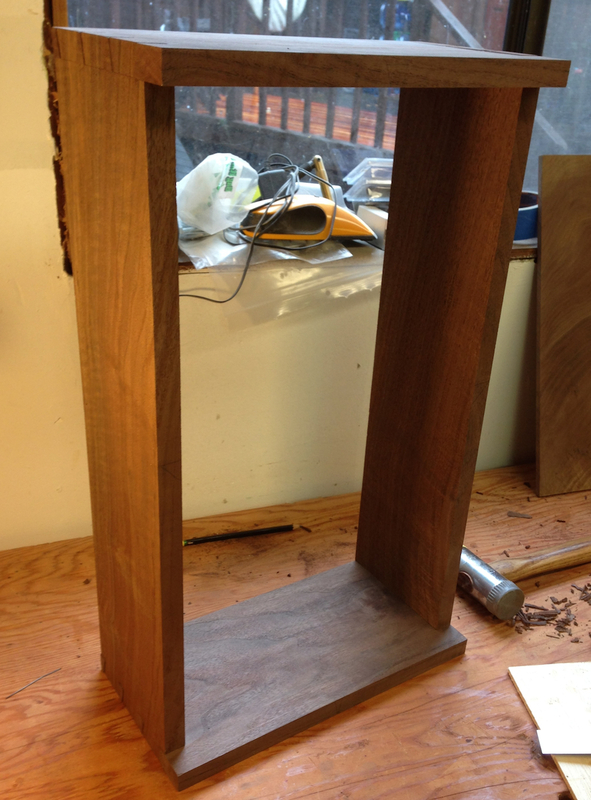 I ripped two strips 1 7/8″ wide, and picked the two lengths for the stiles that had relatively straight grain. Then I picked the two areas that had more interesting figure that I could use for the rails. I laid these out on the book matched panel to see how it might look. 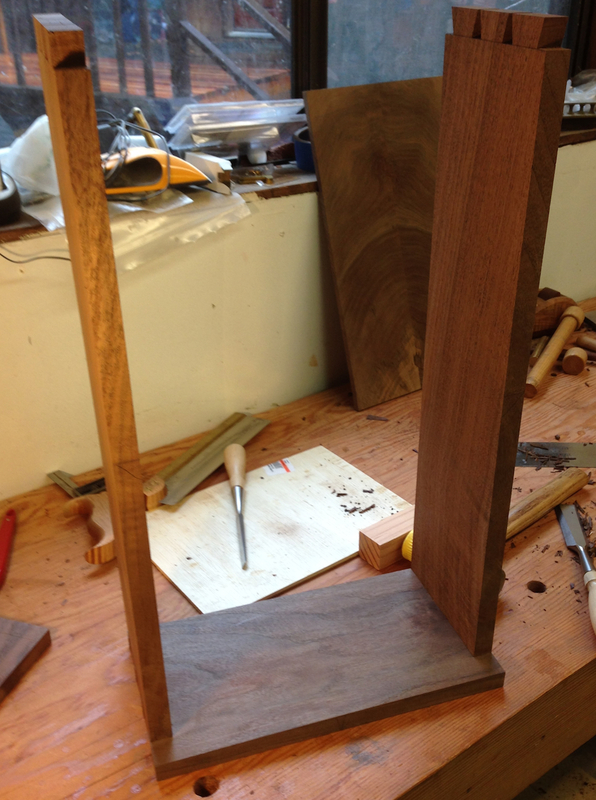 I was going to just make stub tendons on the rails, but decided instead to do through bridle joints. I plowed the grooves and cut the joints and fir it together. The joints need a little tiny bit of fine tuning, and I need to repair a mistake I made, but it’s going to look pretty good I think. I’ll need to shave some material off the top and bottom, it’s a snug fit now. I’m going to use knife hinges to mount the door. Tomorrow I’ll finish the door and glue it up. If I have time I’ll start fitting the hinges and make the back panels. I haven’t decided what to do about the shelves. I could have the be adjustable with pins, or have them fixed in dados. I’m leaning toward adjustable shelves. I absolutely love wood as a material. The color and figure can be just magical. In fact I often stop at the local wood retailers just to browse. I rarely buy wood without a specific project in mind, although I would love to indulge. My shop is small enough that I don’t want to be tripping over wood that isn’t earmarked for a specific project. Raising a family doesn’t leave a lot of folding green for excess wood purchases either. I do have a handful of boards laying around of course. I have a construction grade fir 2×10 that has extremely straight grain and no knots that I was going to use to make a saw bench until I decided it was too nice for that. I have a 1×12 (ish) Alaskan Yellow Cedar board I bought on a whim. Until last week I had several Alder boards that were left overs that I managed to use up on the drawer fronts on my Nail Cabinet. And I have three Claro Walnut boards left of four that I bought a year ago with the intention of making some sort of Krenov-ish cabinet. 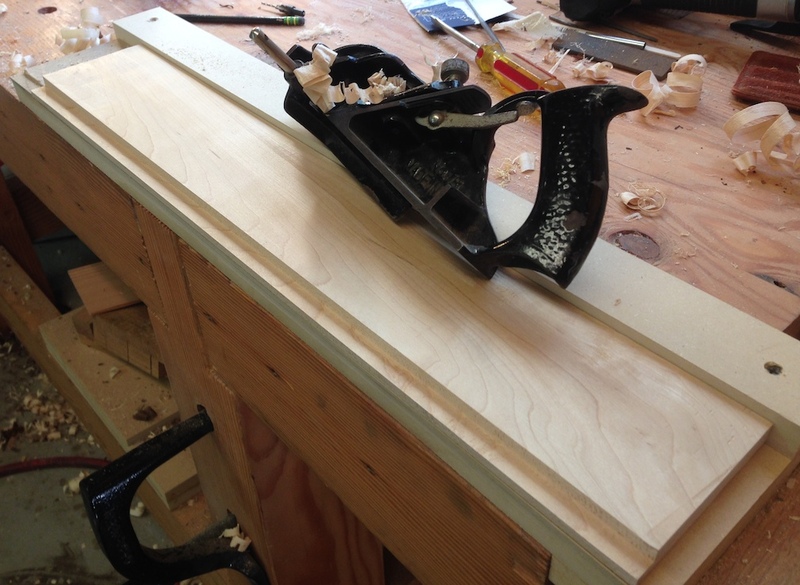 I used one making the leg vise on my workbench, regular readers will remember the saga of the curling Oak plank. It had so much internal stress from drying it peeled apart at the lamination, I had to re-saw it, let it acclimate (which is a fancy word for “continue to warp”), and machine it flat again. 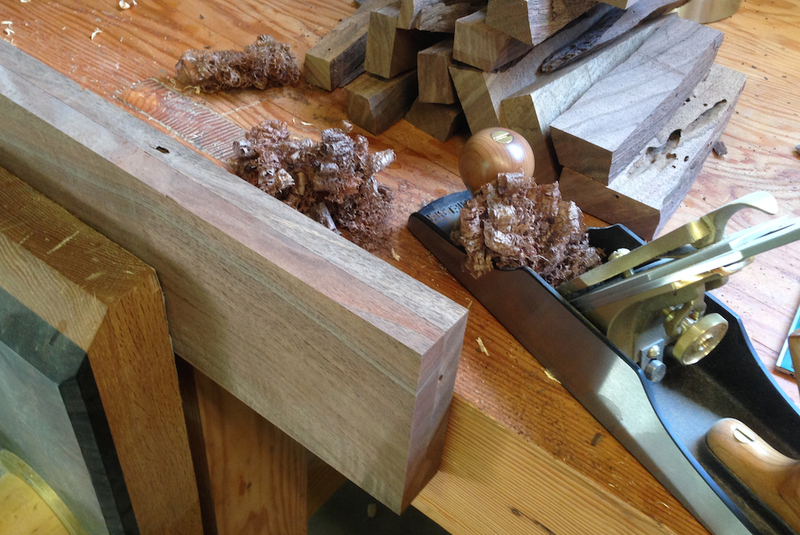 At which point there wasn’t enough Oak left to make a leg vise, so I added in a walnut plank. The vise, by the way, has been amazing. The laminated leg has been solid and hasn’t deformed. The combination of the Lake Eire Toolworks wood screw and the Benchcrafted Criss-Cross Guide works better than I could have hoped. But I digress. I decided to see what I could make out of the remaining Claro Walnut. Claro Walnut, or Juglans Hinds, is a species of Walnut native to Northern California where I live. The trees grow large, often to the point where the trunk doesn’t have any branches for the first 30 or 40 feet and can be slabbed to make 40-50″ wide single piece table tops. It’s also commonly used as root stock in the nursery for English Walnut trees that are bound for orchards. 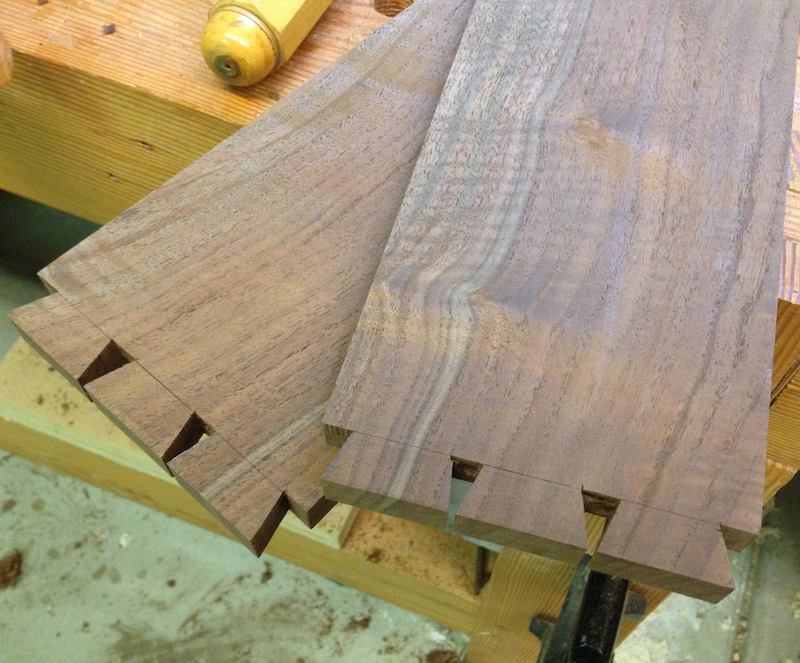 I had three boards left, and I started by jointing and planing them to see what I had to work with. Three Claro Walnut boards, what can I do with these? The boards were rough-sawn, dark and dirty when I bought them at Jackel Enterprises on sale a couple of years ago. Jackel is also not well lit, which has bitten me in the past. And again, as these boards are not the awesome wood I’d hoped for. One (the closest to the front in the picture) had some nice color — streaks of orange and red — and some light curl, but it also had a big water stain on one edge and some punky sap wood on the other. The middle one had beetle holes at the ends, and some unfortunate sap wood pockets. And the last one in the back in the photo…is kind of ugly. It has a weird section of growth patterns at one end and odd grey coloring at the other. 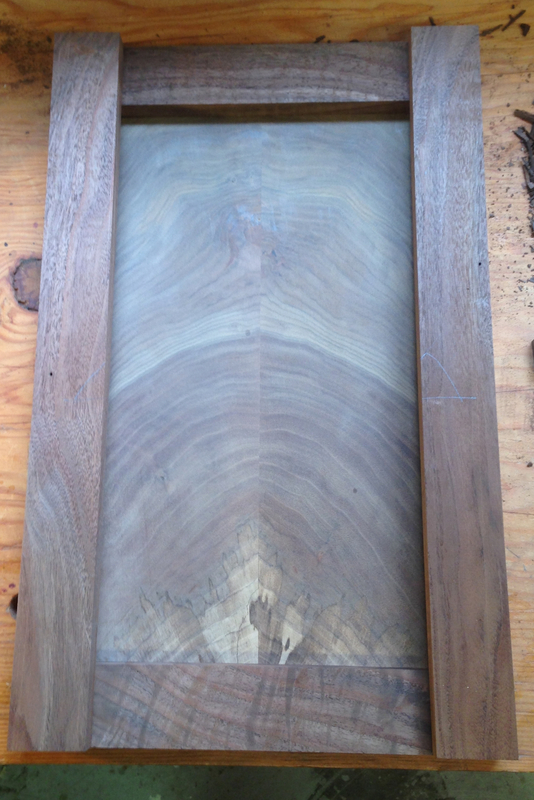 I’m wondering as I write this if it might be from a graft in an orchard and the right side is english walnut. The trick will be getting the base wood where is will show, and hiding the weird stuff. I have a separate panel that I made a while ago out of a small scrap of Claro that I re-sawed and glued up as a book match. My plan is to use this as the panel in the door to the cabinet. I put a quick coat of wax on it to get a sense of how the color and pattern would work. It’s OK, not great – but it’s what I have on hand. 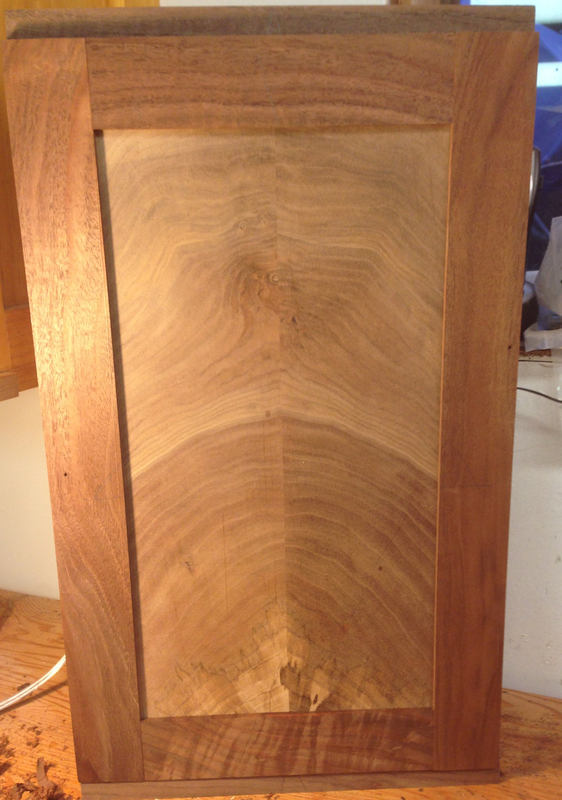 So, working outward from the size of the panel I get to the rough dimensions for the cabinet, 21.5″ tall by 12.75″ wide. Roughly three coffee cups wide by four rows of cups tall. The door will be a frame and panel construction and will overlay the sides but fit between the top and bottom. I haven’t made a final decision on whether the rails or the stiles will be the full dimension of the case. Given the case is taller than wide, my inclination is to make the stiles the full height and the rails shorter, fitting between them. We’ll see how it looks when I get the case assembled. I don’t haven enough Claro for the back, but I do have enough maple for a ship-lap back I think. I want to cut beads into the edges of the ship-lap back, but I don’t have a side-bead molding plane the right scale. I have a 3/8″ (which is too large) and one marked 1/8″ but the actual; bead is only about 1/16″, it’s pretty useless. I think I need one that will cut an actual bead about 3/16″ or 1/4″ wide. Side bead molding planes aren’t particularly rare, so I’m sure I can find one on ebay or maybe Hyperkitten. But before I can start on the back I need to make the case. I ripped and cross cut the sides, then planed the edges and faces to get a nice crisp surface. 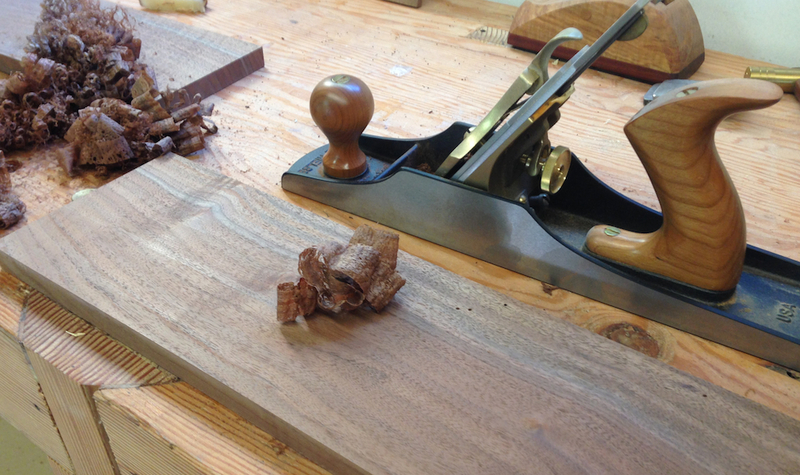 I used my #5 1/2 LN with a high angle frog, and it seemed to handle the walnut pretty well. Just the slightest roughness left in the figured areas, but no visible tear out. 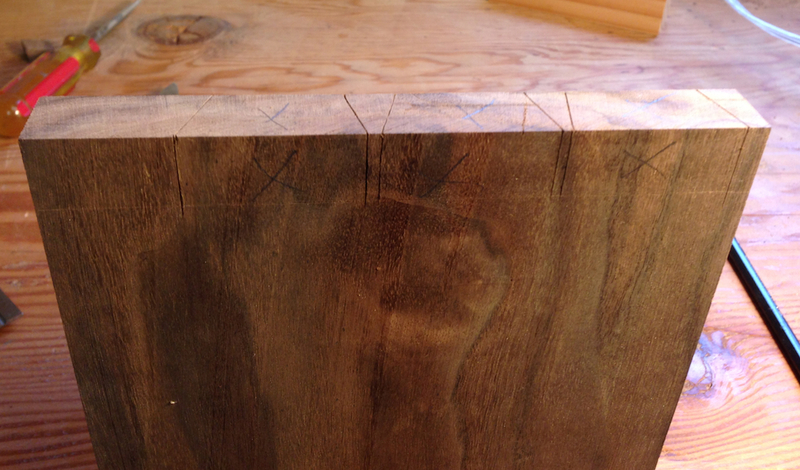 I measured the shavings and I’m getting 0.0015″ thick shavings – that’s one and a half thousandths. I’m using the “140 trick” again to align the case sides and ends when I transfer the tails. It worked so well on the nail cabinet that I’m going to make it a regular part of my procedure. If you’re not familiar with this, the idea is to cut a shallow rabbet on the inside faces of the tail boards before cutting the tails. Then when you lay the tail board onto the pin board the rabbet will align and square the two boards, working as a positive stop. It will also hide and tiny imperfections on the inside baselines. Then I laid out and cut the tails, gang cutting them. I have one minor boo-boo where I had the angle wrong on one of the tails. The morning sun in my shop creates terrible glare on my workbench and I couldn’t see well enough. It isn’t a huge problem, just a slight inconsistency. I’m on the fence as to whether I’ll correct the angle by paring the side of that one tail (it’s ever so slightly wider than the others) or leave it be. The next steps on this project are to transfer the layout for the pins and cut them, test fit the sides, layout and cut the rabbet for the back and assemble the case. I also need to decided on hinges, if I’m going to use knife hinges it would be better to cut the mortises for those before the case is glued up, but after the door is made. And of course I’ll need to order the hinges first.